Local anesthesia is a procedure where a medication is delivered that causes reversible absence of pain sensation, although other senses are often affected as well. It is commonly know as being "numb" at the dentist. Dr. Wiland uses many different techniques to insure that this process is completed with little to no discomfort. A very strong topical gel is placed in the mouth before the anesthetic is given. The type of numbing gel or topical anesthetic gel Dr. Wiland uses is stronger than any other commonly used topicals. 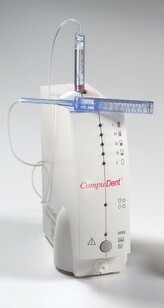 Dr. Wiland uses a small computer controlled device to give the anesthetic instead of the traditional syringe and needle. The WAND is a computer controlled local anesthetic injection system that helps conquer fear, pain and anxiety. A microprocessor controls the flow rate/volume ratio to ensure safe, virtually painless profound anesthesia. The source of discomfort for most injections, however, isn't the needle, it's the flow of the anesthetic into your tissue. The WAND delivers the anesthetic at an optimal flow rate for a comfortable injection. The WAND can result in a more pleasant dental experience. The WAND is an excellent example of Dr. Wiland's efforts to bring you helpful dental technology, and to aid patients to have a pleasant, positive visit. Feel free to contact us today to know more about this remarkable system. Buffering a local anesthetic is when an ingredient such as sodium bicarbonate is added to the anesthetic to make the anesthetic solution less acidic and more comfortable. Part of the discomfort from a local anesthetic is from the acidic nature of the local anesthetic. It has been studied and proven that buffering the anesthetic results is less pain for you and also allows the anesthetic to work faster. Dr. Wiland uses this technique to help you have a very enjoyable experience.